Results 1 - 15 of 18 for "niza"
Collection: Donated by the Hanna Fund, 1954. Color: Brown polished clay with traces of red pigment. Reference: Milliken 1955: 60; Easby and Scott 1970: fig. 155. 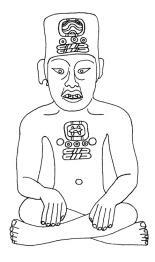 Comments: Known as the "Scribe of Cuilapan" because it resembles a Chinese scribe. There is another almost identical piece at the Museum of Cultures in Oaxaca, but which is slightly taller. See MCO 1170. 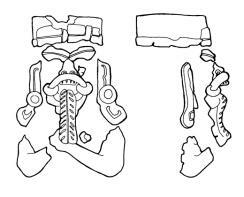 Glyphs: Glyph 13 water in the headdress and 13 Q (flint) on the chest. Provenance: Zaachila (Peñafiel 1893: 24) ; Mitla (F. León 1903? : 115); Cuilapan (N. León 1905: 403). Measurements: 33.5 x 17.5 cm. Color: Polished brown clay with traces of red pigment. Comments: There is a head with the same properties as this piece (cf. Caso and Bernal, 1952: 337, fig. 500bis). There is also a complete piece at the Cleveland Museum (CMA 54.857). 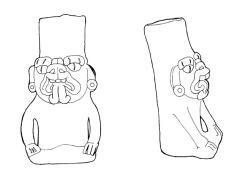 About the pieces, Caso and Bernal comment: "We do not know if we should include it with the figures of period II, because we have not found in Monte Albán, during our stratigraphic explorations, any objects of this style and the two that exist come from the old collections of the National Museum and the Museum of Oaxaca" (1952: 337). 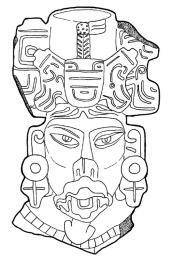 It was always said that this piece came from Cuilapan, but it seems to have been a mistake from León, as from the very beginning, it was established that its provenance was Zaachila. 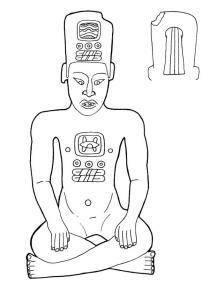 Glyphs: Glyph 13 for water in the headdress and 13 Q on the chest. 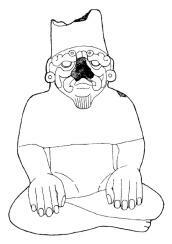 Bernal (1979: 103) interprets the glyphs as 13 water and 13 alligator's eye. Actual Location: Royal Ontario Museum, Toronto, Canada. Color: Grey clay covered with red pigment. Comments: The object held by this feminine figure has the shape of a board, maybe to carry a child. The child's figure is removable and is missing. 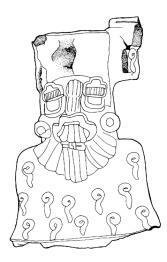 A figure similar to this one was found in San José Mogote, t/1-95, building 1 (cf. 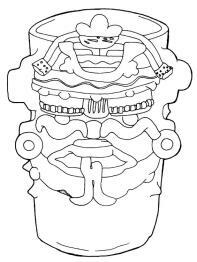 Fernández Dávila, Arqueología Mexicana, 1997: 20). Color: Grey clay. Traces of red pigment. Comments: A very early example of the Cocijo. 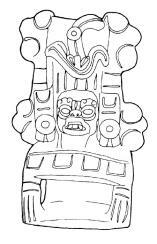 Glyphs: The figure has a variant of glyph C in the headdress. Glyph epsilon or "blood" hanging from the ears. Comments: This piece is fragmented. Glyphs: Glyph C in the headdress (broken). The hairpin glyph decorates the cape (rain?). Measurements: 39.5 a 41 cm. Reference: Photo from Shaplin's files; Parsons 1980: 139, fig. 211. Comments: It belongs to a series of five pieces, all identical. Dating: Shaplin and Zimmerman, 1978, TL no. 9 (165 rads - authentic). Actual Location: Amparo Museum, Puebla, Mexico. Comments: For a comparison with a similar piece, in terms of style, see ROM 1945. 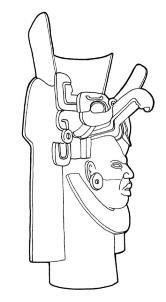 Glyphs: A glyph C in the headdress. Reference: Caso and Bernal 1952: 32, fig. 32. 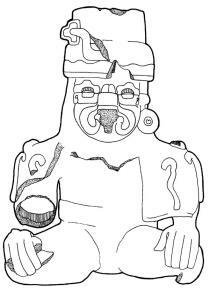 Comments: Human figure with Cocijo mask. Reference: Photo from Shaplin; Parsons 1980: 129, fig. 192. Dating: Shaplin and Zimmerman, 1978, TL no. 85 (700 rads - authentic). Measurements: 27 x 21 cm. 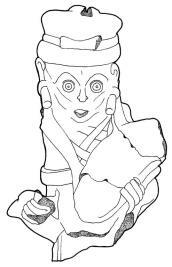 Reference: Example of an early Cocijo effigy. Measurements: 36.5 x 23 cm. Glyphs: The hairpin glyph decorates the garments. Reference: Parsons 1980: 131, fig. 197. Comments: This piece is part of a series of four identical objects. 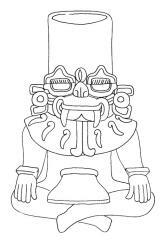 The human figure is wearing a Cocijo mask. Glyphs: Glyph C in the headdress (early version). Provenance: Bajos de Chila, Oaxaca. Measurements: 22 x 15 cm. Color: Headdress with graffito paint. 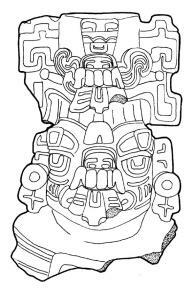 Comments: This piece was found by Donald Brockington in 1969, while travelling through the coast of Oaxaca. 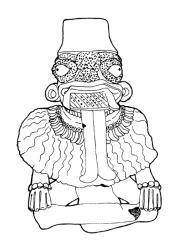 It was associated with stelae number one in the archaeological site of Chila (Brockington et al. 1974: 58-62). The piece was covered with a big plate decorated in black and red. 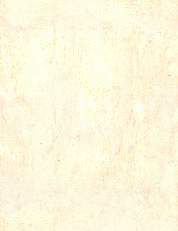 The drawing is based on Jorrín (1974). In a letter from Brockington to Philippa Shaplin (01/19/76), the archaeologist established phase MA II or II-IIIA Transition.